The Thanksgiving Day meal pushes many seldom-eaten foods briefly into the limelight: brussels sprouts, stuffing, pumpkin pie, sweet potatoes with marshmallows, even the roast turkey itself. And cranberries. I like cranberries. I hailed the development of cranberry juice and cranapple juice. 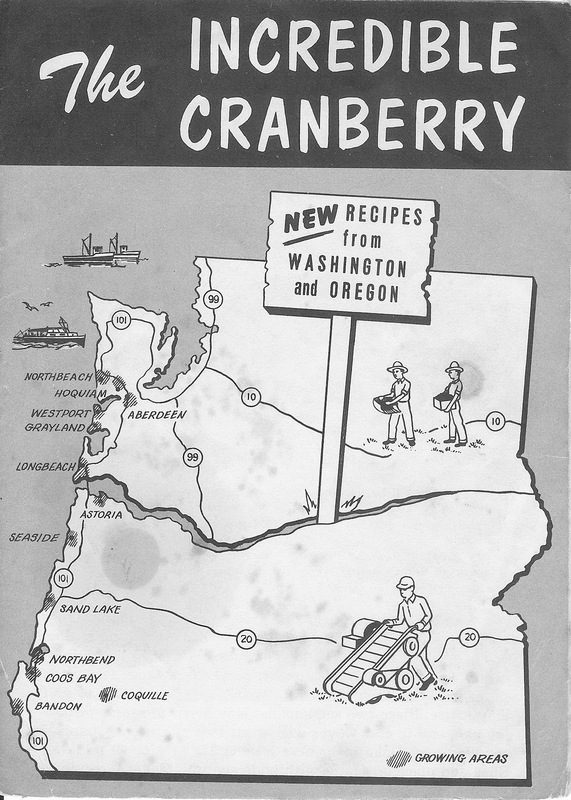 I grew up on the Oregon coast, where cranberries were grown; my father, as a government weatherman, was regularly on the Astoria radio stations giving the weather report, which at appropriate times included noting the overnight forecast for freezing temperatures “in the bogs”: the warning to cranberry growers to flood the fields to protect the crop. My mother always made a Thanksgiving Day relish of fresh cranberries, an orange, and sugar, run through the meat grinder. An excellent combination, and an easy and foolproof recipe. I like to squeeze an orange, add sugar, heat it up, and add fresh cranberries, boiling them lightly until the berries pop; when you set the mixture aside, it cools as a delicious and lumpy thick sauce. Another excellent and easy recipe. Our Dad often cooked, and he made a most delicious meat loaf. Our family preferred the every-loaf-is-different approach, and we also belonged to the lumpy, not smooth, school of meat loaf building. So we had chunky meat loaf that might include some combination of chopped onion, celery, sweet pepper, leftover broccoli, an egg, condensed milk, Worcestershire sauce, rolled oats, cooked rice, bread crumbs, tomatoes, and/or tomato catsup, along with the usual ground beef, ground pork or sausage, and assorted herbs. It was always a treat. But then, sometime in the early 1970s, Dad got his hands on a recipe that called for mounding the meat loaf ingredients over a log of canned, jelly-like cranberry sauce. My sister Laural and I independently concluded that this was a terrible development, but by the mid-1970s, our Mom had died and Laural and I had gone our own ways: the result was that, for the next two decades, each of us was from time to time subjected to seeing Dad and being offered what he was sure was one of our favorite meals, featuring cranberry meat loaf. Several times we were so subjected together, along with our respective spouses. Oh, the grimaces we suppressed. Finally, having compared notes, Laural and I confronted Dad and told him the bad news: we both hated cranberry meat loaf. Yes, we loved his un-cranberry meat loaf, and we were sorry we hadn’t told him sooner. He was crestfallen, dismayed, taken aback: we had eaten so many cranberry meat loaves! But he adapted. Thank goodness. 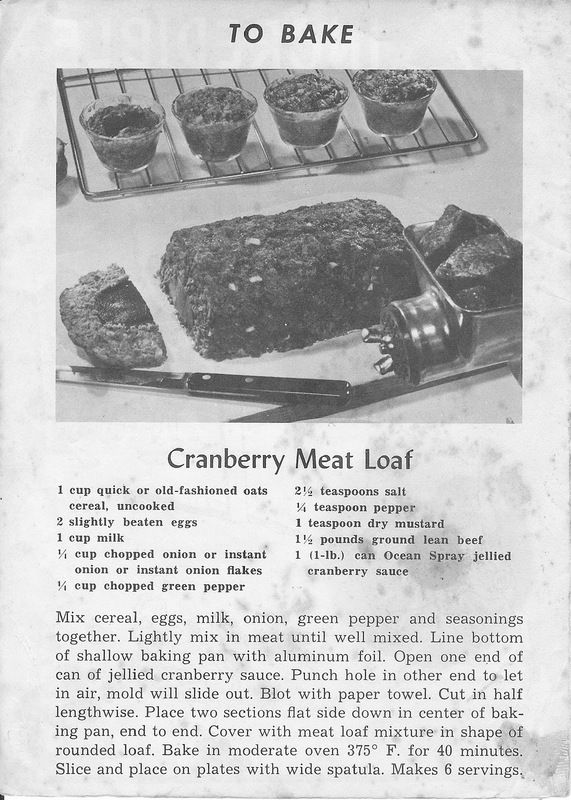 After Dad’s death a few years ago, I ran across a tattered leaflet in one of his cookbooks: here is the origin of the cranberry meatloaf. Try it if you dare. Only if you dare.